A custom Android launcher called Terrain Home that functions similarly to Google Now has arrived on the Google Play Store, but with even more cards to show you all the information you need at a quick glance. The launcher aims to make your Android user experience “simpler and more streamlined by putting everything you care about in one place,” and the app is made by a developer, sponsored by Samsung’s Accelerator start-up incubator. Terrain Home has three home panels: a central one that looks like regular Android, one on the left (swipe to the right to bring it up), with a Google Now-like card interface, and another one on the right, with an app drawer that you can easily search through. After playing with it for a while, we are definitely left with the impression of this being a mix of Google Now ideas and Aviate-like aesthetics. It is indeed a simple launcher that allows a bit more flexibility than Aviate, and it takes pride in having no battery impact. You can take a look at it below - it’s free to download. You're the only survivor in this comment section before me, tell me what happened before? Where is my comment and my follow is still on. What did you say in your comment before? 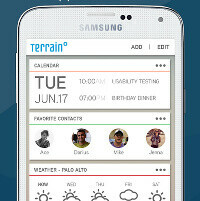 "this is what touchwiz should look like" something like that. Hmmm... This is weird, a comment like that should not be deleted. They would be one ugly and outdated looking interface then. 2010 much? Hmmn! my comment got deleted too, i only said the App is in beta full of bugs, very good concept and should replace touchwiz once optimised.